About this time last year Scott from the Runner’s Flat was wondering where the snow was. He was preparing to host the Iowa Games SnowShoe Championships and Mother Nature just wasn’t cooperating. He did what he could with what he was given and the event went on. We think he felt partially obligated since we had brewed SnowShoe 2013 specially for the occasion. The beer turned out almost as cool as the participants that showed up and hit the trails with him that weekend. Sweet, now on to the beers. SnowShoe 2014 rolled out last week and the flavor profile is spot on with the 2013 version. Roasty, dark chocolate and coffee tones aside hints of caramel, then featuring a graciously hoppy finish. I’m not gonna call it a Black IPA, but it sure shares some qualities with that style. Cool beer. 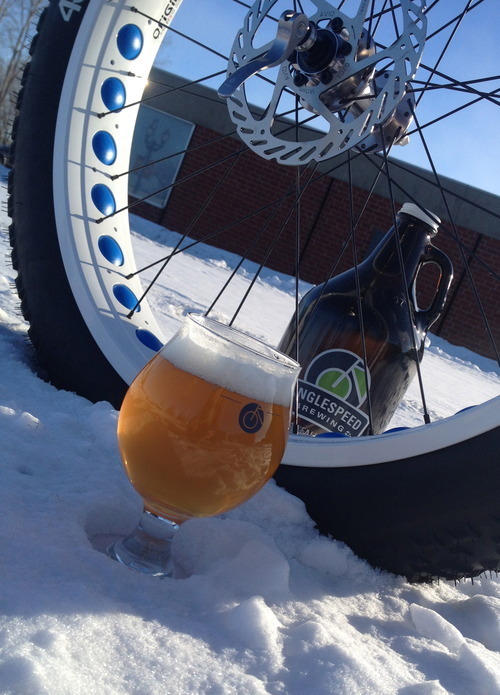 That brings us to SnowBike 2014, a courageous Belgian IPA. 7.7% ABV and 58 IBUs of American hop goodness. This beer is essentially one part Belgian Tripel, one part American IPA We embrace the fusion and hope you do the same. The schedule says we launch SnowBike this coming Saturday evening (1/25) during the Ragbrai Route Announcement Party we are hosting in the tasting room. Hope to see you there.